What are Seed & Food Sovereignty? "Many small, diverse farms with decentralised but connected support systems present a living alternative to the corporate-industrial model. Resistance against corporate encroachment into food and seed systems, coupled with the practical development of alternatives are both required to confront the conditions facing smallholder farmers and their seed and production systems in South Africa today." "It's all part of the corporate takeover of the continent's agriculture at the expense of the small farmers who feed most of Africa's people." "An elite group of aid donors and agribusiness corporations met in London this week to plan the takeover of Africa's seeds ... replacing traditional seed breeding and saving by small farmers with a corporate model of privatized, 'improved', patented, genetically uniform and hybrid seeds in a profit-driven market." "Food sovereignty has now left its rural origins and become a movement in which both consumers and producers seek to reclaim or reinvent food systems from the bottom up. Indeed, in all regions, groups of ordinary citizens are developing ways to gain autonomy and bypass the dominant industrial food systems." "Ignoring the calls of a wide range of experts for bottom-up seed solutions that benefit the poorest, the World Bank’s agribusiness indicator will foster seed scarcity for the sake of corporate profit." European Patents on Plants and Animals: Is the Patent Industry Taking Control of Our Food? This report illustrates how patents are on the verge of breaking through acceptable boundaries and putting our genetic resources at risk. Will our daily food soon be controlled by big corporations and the patent industry, or will our politicians make decisions to ensure that patents on plants and animals are prohibited? "This research was the first step in a process to identify the variety of seeds farmers are using, whether these seeds are suitable for their needs, what sorts of improvements farmers desire, and to determine if farmers are interested to take this issue further ..."
See his extended article: What Does Food Sovereignty Look Like? "From Asia to South America, the EU to the Caribbean, the corporate seed industry is using international trade agreements to criminalise farmers for saving seeds"
"The latest salvo in the battle over Africa's seed systems has been fired ... with the Gates Foundation and USAID playing puppet-masters to Africa's governments ... as they drive forward corporation-friendly seed regulations that exclude and marginalize the small farmers whose seeds and labour feed the continent." "Around the world, plant breeders are resisting what they see as corporate control of the food supply by making seeds available for other breeders to use." "Centrally, the report makes a compelling case for an alternative and potentially more useful approach to support black small-scale farmer seed production within farmer seed systems (outside the formal sector), rather than trying to integrate small-scale farmers into commercial production systems where they stand little chance of competing effectively." OSSI Pledge: "This Open Source Seed pledge is intended to ensure your freedom to use the seed contained herein in any way you choose, and to make sure those freedoms are enjoyed by all subsequent users. By opening this packet, you pledge that you will not restrict others’ use of these seeds and their derivatives by patents, licenses, or any other means. You pledge that if you transfer these seeds or their derivatives they will also be accompanied by this pledge." "New research shows, the expansion of intellectual property rights on seeds might well restrict small-scale farmers’ practices of seed saving and use, exchange and selling in the informal seed supply system, limiting access to seeds and putting their right to food at risk." "Training Materials for smallholder farmers in Africa in several languages on a range of topics including on: the value of farmer seed systems; Intellectual property rights and UPOV 1991; ARIPO PVP Protocol; women as custodians of seed and many more." Putting the Cartel Before the Horse ... and Farm, Seeds, Soil, Peasants, etc: Who Will Control Agricultural Inputs? 1. What is a Seed Law; 2. What is Quality Declared Seed; 3. What are the DUS criteria; 4. Impacts of Seed Laws on farmer managed seed systems; 5. Harmonisation of Africa’s seed laws through SADC and COMESA; 6. Impacts of harmonisation of seed laws on farmer managed seed systems and small scale farmers; 7. Seed sovereignty for small-scale farmers. Please contact the ACB office, Office@acbio.org.za, for information on ordering the posters. 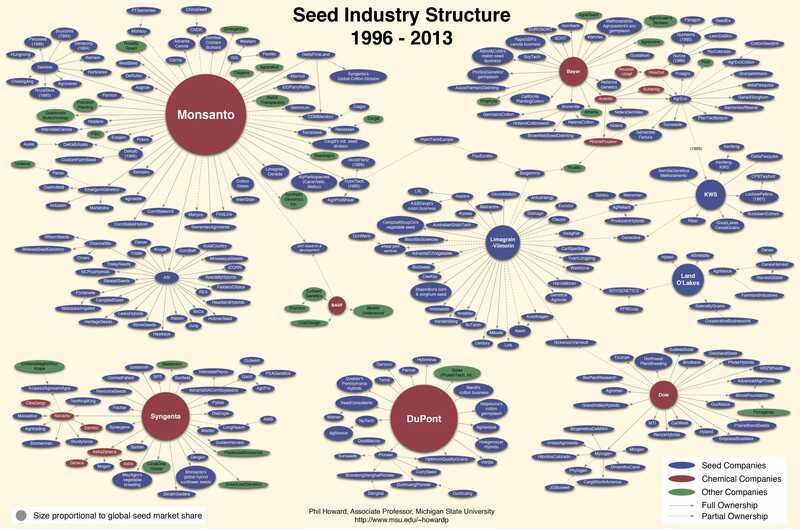 "Seeds are under attack everywhere. Under corporate pressure, laws in many countries increasingly put limitations on what farmers can do with their seeds and with the seeds they buy. Seed saving, a thousand-year-old practice which forms the basis of farming, is fast becoming criminalised. What can we do about this?" "Whoever controls the seeds controls the food supply. By empowering communities to preserve and protect the genetic diversity of their harvest, 'Seed Libraries' is the first step towards reclaiming our self-reliance while enhancing food security and ensuring that the future of food is healthy, vibrant, tasty, and nutritious." "Few things on Earth are as miraculous and vital as seeds. Worshipped and treasured since the dawn of humankind. SEED: The Untold Story follows passionate seed keepers protecting our 12,000 year-old food legacy. In the last century, 94% of our seed varieties have disappeared. As biotech chemical companies control the majority of our seeds, farmers, scientists, lawyers, and indigenous seed keepers fight a David and Goliath battle to defend the future of our food. In a harrowing and heartening story, these reluctant heroes rekindle a lost connection to our most treasured resource and revive a culture connected to seeds." "The main characters are the seeds - indigenous, native, ours - in the hands of rural communities and indigenous peoples. The documentary illustrates that the defence of native seeds is integral to the defence of territory, life and peoples’ autonomy. It also addresses the relationship between indigenous women and native seeds, as well as the importance of seed exchanges within communities." Urgent action is needed to ensure that farmers today can grow resilient, nutritious food for us all, in the face of climate change and other challenges. At the core of such action must be strategies to revive the diversity of seed that has been lost from the world’s fields, and to support the knowledge and diversity that remains. "Today, we are faced with two life threatening planetary crises – climate change and species extinction. Both crises are inter-connected, and have common roots. Our current modes of production and consumption based on fossil fuels - starting with the industrial revolution and intensified by the advent of industrial agriculture, have contributed to both these crises." "The purpose of our State of Organic Seed project is to measure the progress we’re making in increasing the availability, quality, and integrity of organic seed. We envision an organic food system built on a foundation of organic seed. This report serves as an important summary of ongoing challenges to achieving this goal, and includes updated recommendations to guide research, education, and policy efforts for the next five years"
"Under the new law, Tanzanian farmers risk a prison sentence of at least 12 years or a fine of over €205,300, or both, if they sell seeds that are not certified." "Agricultural biodiversity is essential to the future of food. A deep pool of biodiversity will ensure that we have plant species and varieties that can withstand changing weather patterns. Agricultural biodiversity is directly connected to global nutrition, dietary health, cultural and culinary diversity, and to the resilience of local economies and markets. Seeds are central to the everyday practices of small-scale farmers that feed 70 per cent of the world’s population." "In recent years, prominent international donors’ initiatives have focused on supporting industrial agriculture and large agribusiness companies at the expense of family farmers. The World Bank’s 'Enabling the Business of Agriculture' (EBA), is one of these initiatives." Too Big to Feed Us! "Harmonised regional seed laws influence the shaping of national seed legislation, including plant variety protection laws. These are primarily determined by political and economic interests, as private seed companies seek to expand their business ventures into wider markets in Africa. On the other hand, farmer managed seed systems (FMSS), which are the basis of agricultural systems on the continent, are pointedly ignored, undermined and criminalised. This has huge implications for smallholder farms, where 80% of the seed used is from FMSS. These systems feed the continent, ensuring nutrition and supporting livelihoods, and are central to agroecological systems, cultural practices and biodiversity conservation." UPOV91: The Apartheid Seed Law: Why Would Anyone Want to Destroy Farmers' Experimentation and Knowledge? UPOV91 is trying to establish, by law, the inferior status of smallholder farmers who breed and do scientific experiments in the field. It legitimizes the corporate plant breeders' entitlement and presumed superiority. The normative law translates back into profit for the corporations benefiting from PVP - plant variety protection. This constructed distinction between two different types of breeding becomes a "ritual of truth". "All over the world, farmer’s seeds and seed systems are under attack. Corporations are pushing for ever more aggressive new laws and regulations that criminalise farmers for sowing, keeping, exchanging, and taking care of their seeds. If companies get their way, farmers around the world will face the possibility of being jailed or harshly fined for doing what they have been doing over centuries." "Safeguarding water for the dignity, health, food and nutrition security of everyone on the planet is one of humanity’ biggest challenges. The analysis and the recommendations of this report are a contribution to this ambitious roadmap." "As much as 75 percent of global seed diversity in staple food crops is held and actively used by a wide range of small farmholders -- workers of less than three to seven acres -- with the rest in gene banks, according to a Penn State geographer."